Get away...without letting your responsibilities get away from you. No matter how much planning you do, there always seems to be one or two important documents to review or approvals that have to be completed while you’re out of the office. Luckily, there’s a way to quickly and conveniently take care of business, even while you’re taking some time off. Slideshow: Using new mobile tech to help make PTO more restful and enjoyable. Keep those high priority projects moving along while you move along down the highway.This short slideshare reveals some important mobile stats and explores how you can empower yourself and your workforce. "Sign anywhere. Making your work life better, faster, easier (and cooler) with mobile technology." 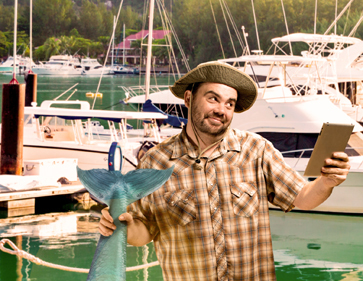 More than 60% of employees check their emails daily while on vacation. * This ebook explores the mobile trends that are transforming how business gets done. Plus, it offers real-world examples of how companies like yours are using the new accessibility to their advantage. 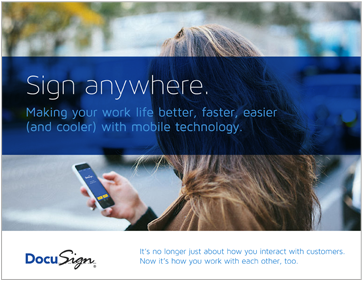 Over a third of our customers DocuSign on their mobile device.Visit the DocuSign Mobile page for more info. Imagine NDAs, invoices, project proposals, purchase orders, time sheets, RFPs, permissions, reviews, sign-offs – you know, those tiresome paper pushing processes – all accessible, transferable, reviewable, approvable, and actionable via any digital device. DocuSign is changing how business gets done by empowering more than 225,000 companies and more than 85 million users in 188 countries to send, sign and manage documents anytime, anywhere, on any device with trust and confidence. DocuSign replaces printing, faxing, scanning, and overnight paper documents to transact business. DocuSign enables organizations of every size, industry and geography to make every decision, approval, workflow and signature fully digital. DocuSign and Go to keep life and business moving forward.